"The Snowman" -- Grand Rapids Symphony screens the half-hour film based on the award-winning children's book by Raymond Briggs with live music composed by Howard Blake at 3 p.m. Nov. 19 in DeVos Performance Hall. "Harry Potter and the Sorcerer's Stone" -- Grand Rapids Symphony presents the first film in the Harry Potter series with music by John Williams at 8 p.m. Jan. 27 and at 3 p.m. and 8 p.m. Jan. 28 in DeVos Performance Hall. "E.T. The Extra-Terrestrial" was one of film composer John Williams’ greatest triumphs. Typically, the way films are made, composers are brought on board as a film is being edited. After viewing the final cut, they have mere weeks to compose and record music that will forever be attached to the movie. It’s that fast. 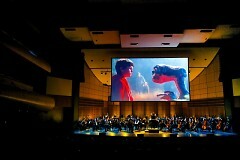 When Williams set out record the soundtrack for the finale of the story about a boy who befriends a lost alien, he struggled to fit the square peg of his music into the round hole of Steven Spielberg’s final cut. Spielberg shrewdly decided to break the rules. He told Williams to conduct and record the soundtrack as if he were giving a concert and Spielberg would re-edit the final cut. The result was four Academy Awards including one for Williams for Best Original Score. Nearly 35 years later, you still can feel the magic. The Grand Rapids Pops presented E.T. 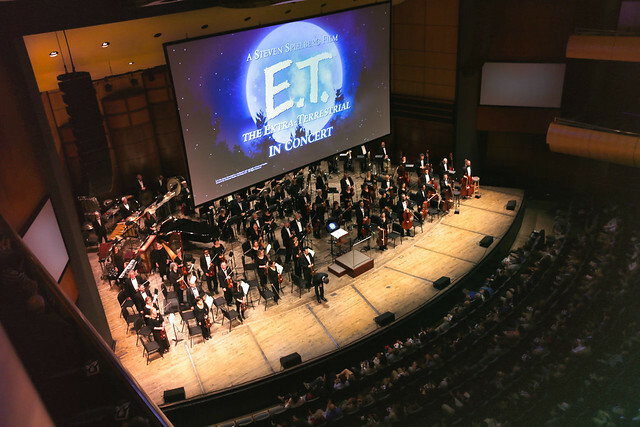 The Extra Terrestrial, the entire film plus live music, in three performances on Friday, November 4 through Sunday, November 6, in DeVos Performance Hall. Friday's opening night performance ending in an enthusiastic standing ovation from an audience of some 1,330 people at the Fox Motors Pops Series show. If you’re a fan of the tender-hearted, Elliott, who lures E.T. into his home with handfuls of Reese’s Pieces; or his cute-as-a-bug sister, Gertie, who plays dress up with the visitor from another planet, you need to see this show. 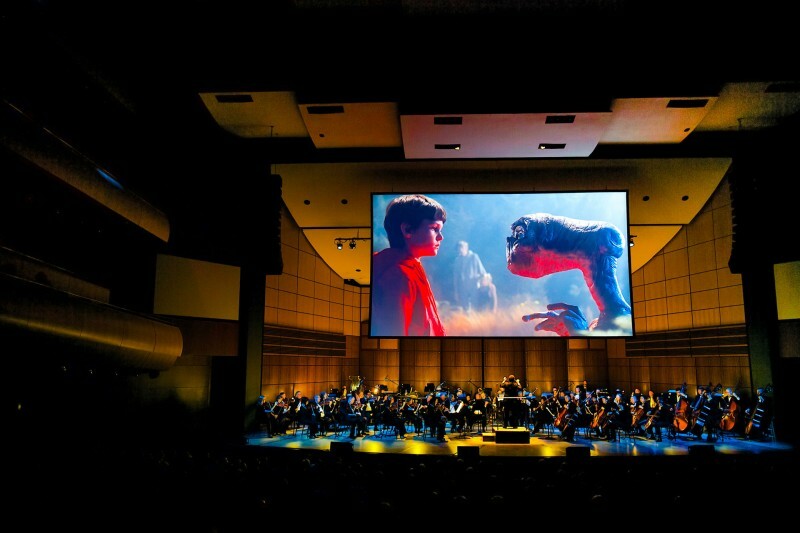 As touching as it may be to watch at home on Netflix, it’s so much better to see on the big screen, to hear the larger-than-life sounds of the Grand Rapids Symphony, and to share the experience with more than a thousand of your friends, family and fellow travelers. Associate Conductor John Varineau skillfully led the Grand Rapids Symphony in more than two hours of music from the quiet introduction played by a single flute to the cataclysmic finale when Elliot and his friends successfully send E.T. back home. It’s a story with moments of heartbreak and humor, with scenes frightening as well as too funny for words. So it needs a monster score with snippets of eerie, other-worldly effects, as well as epic, grand climaxes. Amazingly, at times it’s almost a concerto for harp and orchestra. Principal harpist Elizabeth Colpean held the audience in rapt attention in several scenes such as when Elliot, alone in his bedroom, truly comes face to face with visitor from another planet. Her harp added to the enchantment. Because scenes change so quickly in films, the music frequently changes in the blink of an eye. It’s one thing to do in a recording studio with multiple takes plus an editor. 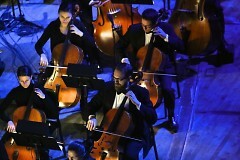 It’s another thing for a conductor and an 80-piece orchestra to do in semi-darkness before a live audience. 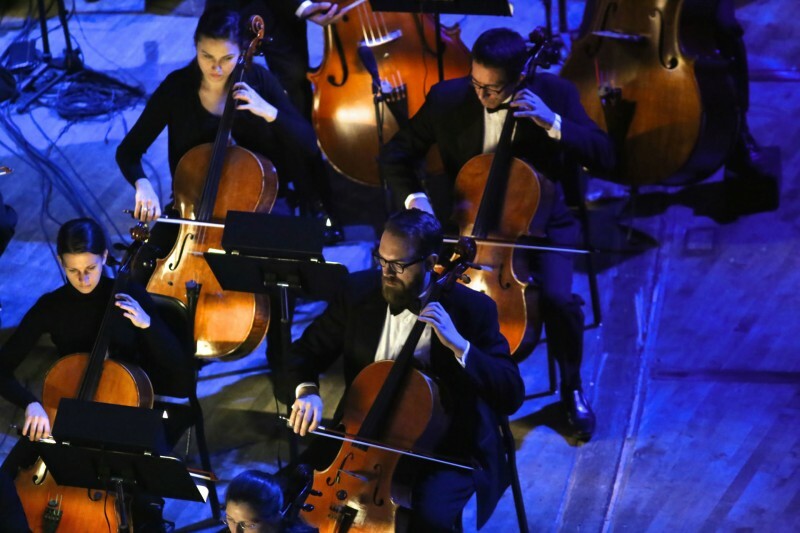 Under Varineau’s leadership, the Grand Rapids Symphony’s 80 musicians shifted seamlessly time and time again, conveying the worry of approaching law enforcement officials to the wonder of Elliott and E.T. flying off a cliff and into the sky for the first time. In fact, it’s fair to say that if you turn off the music, the final scenes make no sense at all. Kids on bikes, pedaling uphill, rolling downhill, evading authorities as they hurry to return to E.T. to his spaceship, would look ridiculous without the music. But when the music outlines the story, identifies the characters, explains their motivations, and lets the audience feel the same feelings that the characters are experiencing on the screen, that’s when it all comes together. The film is inspiring on its own. With live music, it’s even more thrilling.